Evil lairs are always inaccessible. Impenetrable. And the constant distance creates an aura of mystery about the place. A handful of interactions grow into a half-true caricature of the people who actually reside there. I had seen the view above many times over the years, and a similar kind of caricature had grown in my mind. In my imagination, the people working in the tower were sticklers for everything. They loved rules, order, and nothing else. Finally, in 2016, I was able to take a glimpse behind the curtain. And I can say for certain that the notions that I had were not the full story, and they were not a fair depiction either. Of course, I should have known that. As with any fractal, the traits that I came to appreciate about the pit marshals, the flaggers, and the safety crew also reflect the traits of the race control team itself. And vice-versa. This is definitely a race where the details show you the bigger picture. But the opposite is also true: the big picture can show you hidden details. 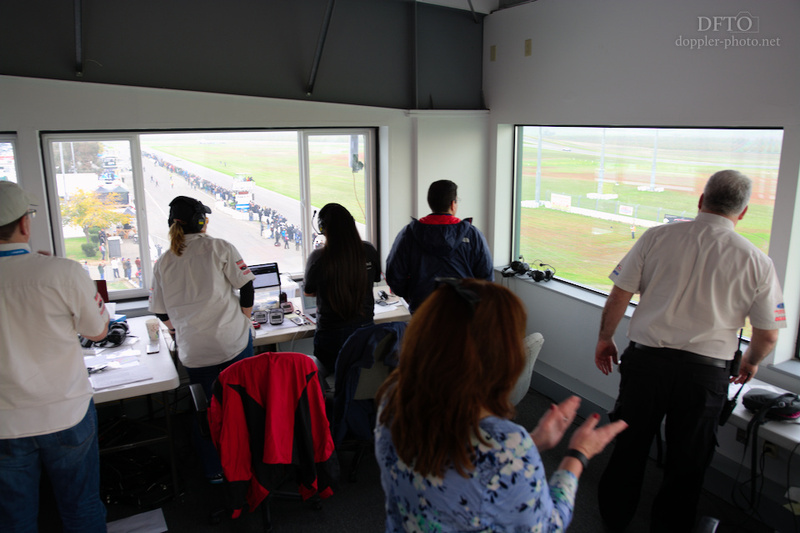 Race control is the glue that helps the other teams work well together. 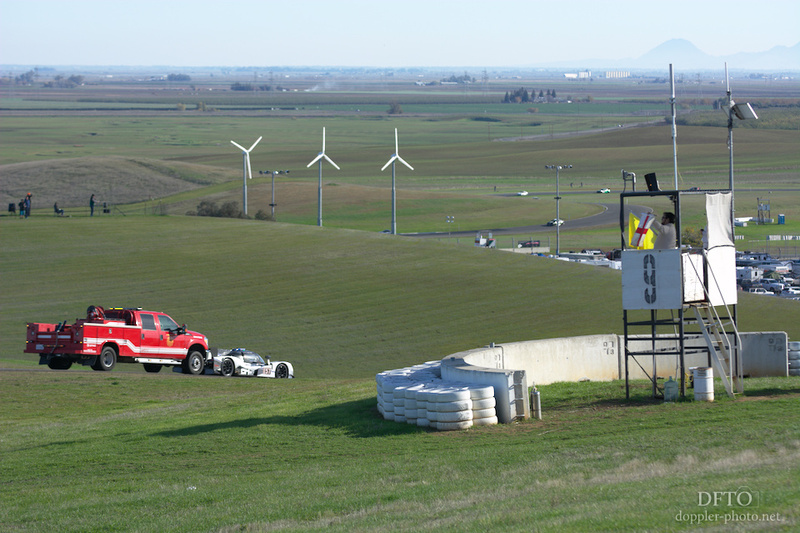 When a flagger calls in an incident, it's race control that tells Safety how many trucks to roll. The individual flagger might not know whether any particular truck is already working a tow, or otherwise occupied. 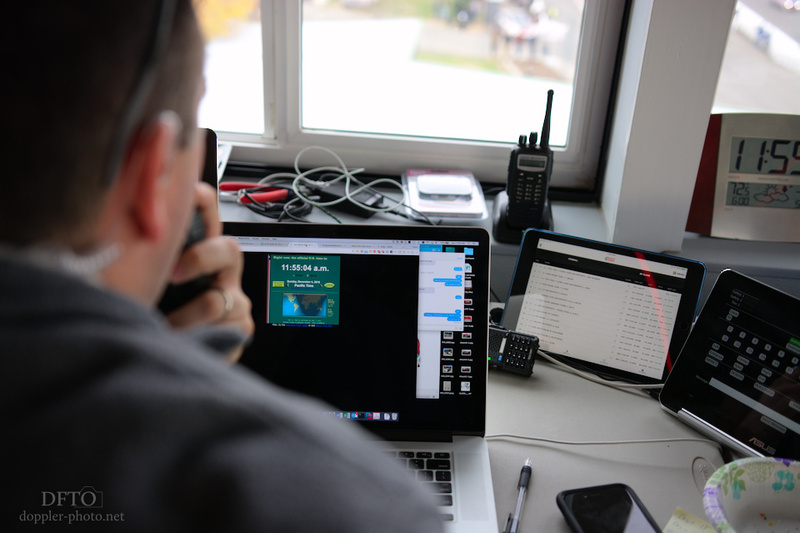 Race control stays on top of the bigger picture and handles dispatch in light of the full track situation. 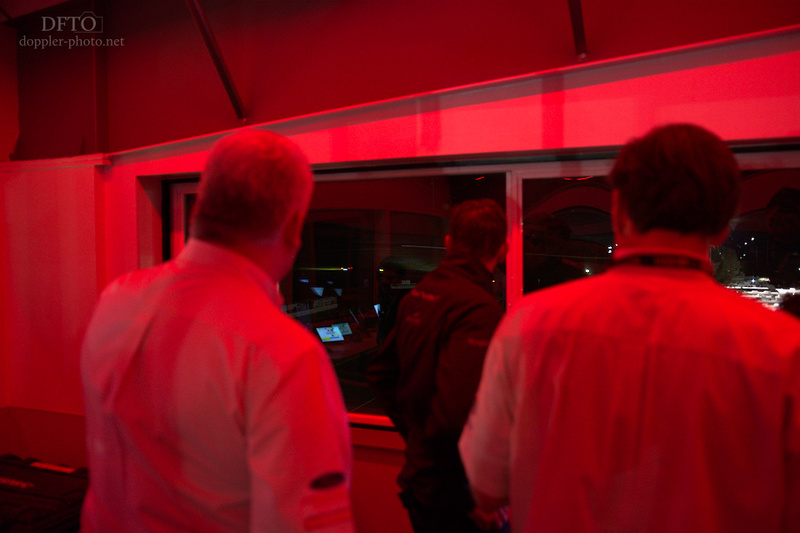 And when the pit marshals needed a hand finding pit boxes faster, race control had the answer. A quick cell-phone picture of the pit box chart and their job got a little smoother. 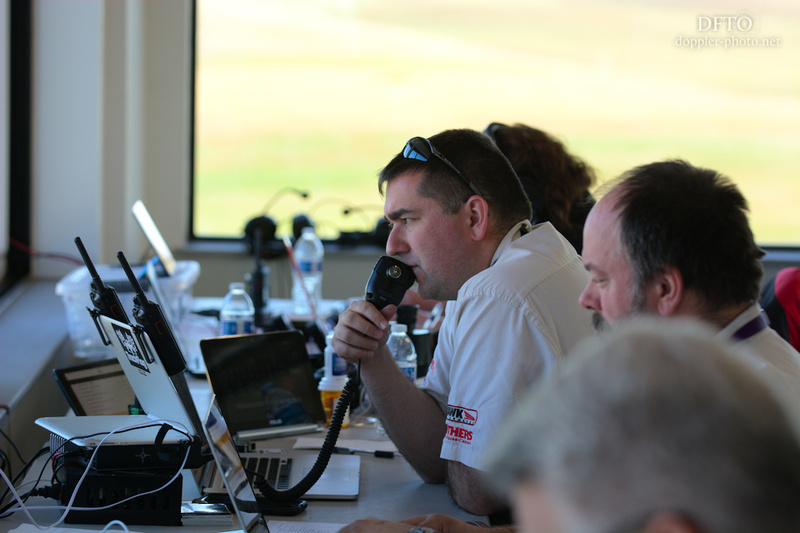 Race control also helps to fine-tune how the teams do their jobs. In this case, Robert pointed out that flaggers shouldn't necessarily show a yellow flag when they show the safety vehicle flag — if a safety vehicle is passing by at speed, then the safety flag alone is sufficient. So the folks on race control are organized. They're also... well... people. They're multi-faceted. They have a job, but there's more to them than just an ability to do that job — they care about people, and not just about rules and tasks. Saturday night, a car re-entered the track without turning on its driving lights. It was rear-ended at high speed almost immediately. In the aftermath, I heard someone in the room say "I'm glad they're okay." A moment later, another commiserated, "Yeah, you never get used to it. It's always nerve-wracking." 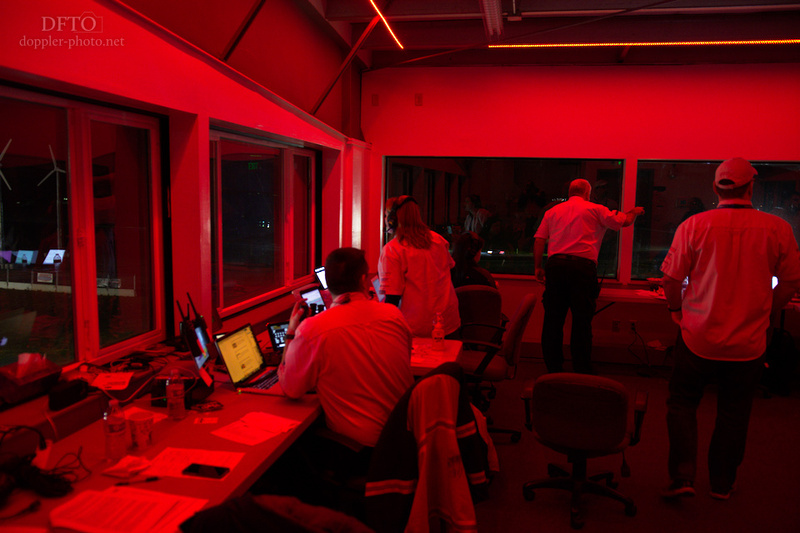 It was interesting to see how the team improvised while coordinating the response to a fairly stressful situation. Everyone's head was on a swivel. I heard Jerry Kunzman shout "get the safety car on track right now! ", and then once the pack was down to a reasonable speed, they waved single cars past until the lead car was at the front of the line again. Better that, presumably, than to have a two-car incident collect other vehicles. 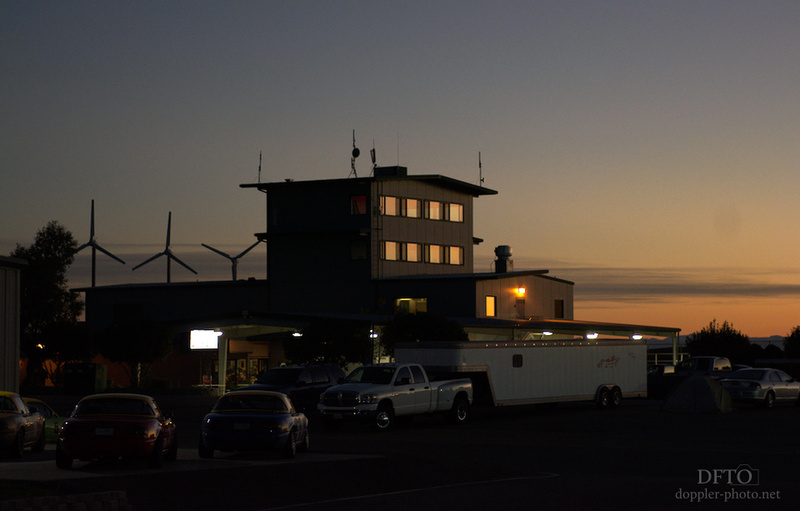 The incident also highlighted some ways that the race itself has changed. During a short chat, Jerry told me that NASA had designed and built two apps in-house that have helped to make the race safer. One app helps them convey specific information (apex? track right? impact? fire?) in a persistent way for safety vehicle dispatch. The other allows race control to broadcast flag conditions to anyone with a specific smartphone app. 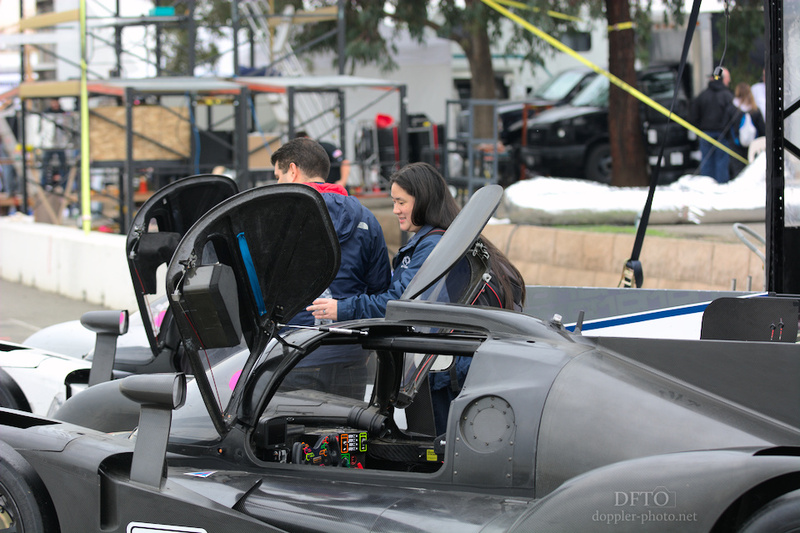 So teams can mount a smartphone in the race car, and the driver will have a clear indication of the flag conditions around the track. 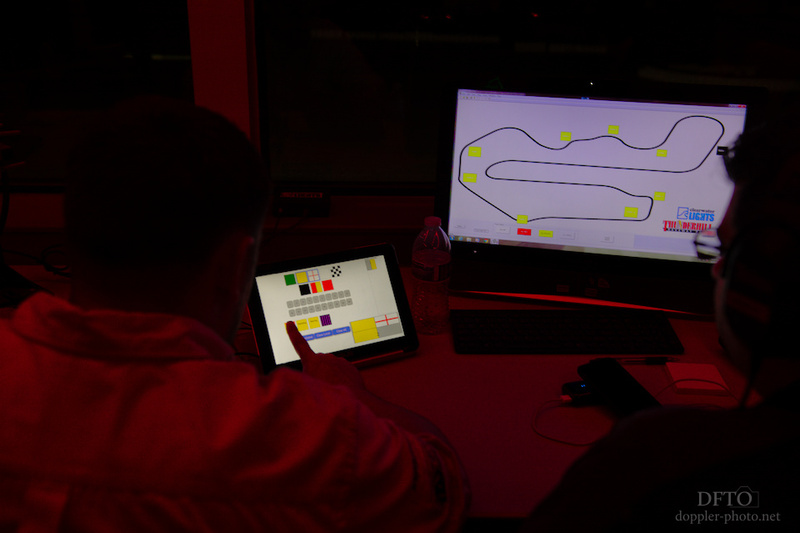 The picture shows someone using a touchscreen to add the surface flag (due to fluid or debris) to an existing full-course yellow with safety on-scene at turn 2. The touch-screen on the right controls the lights at all of the flag stations. 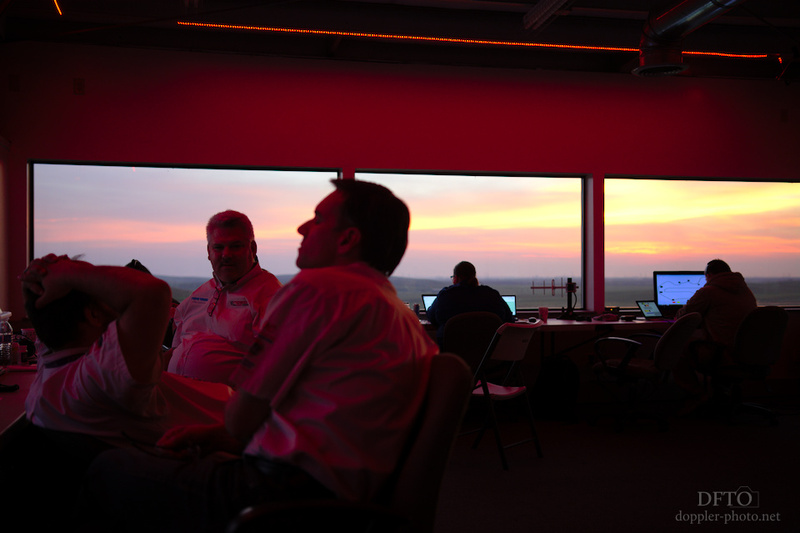 Sunrise saw the race control team a bit more relaxed. 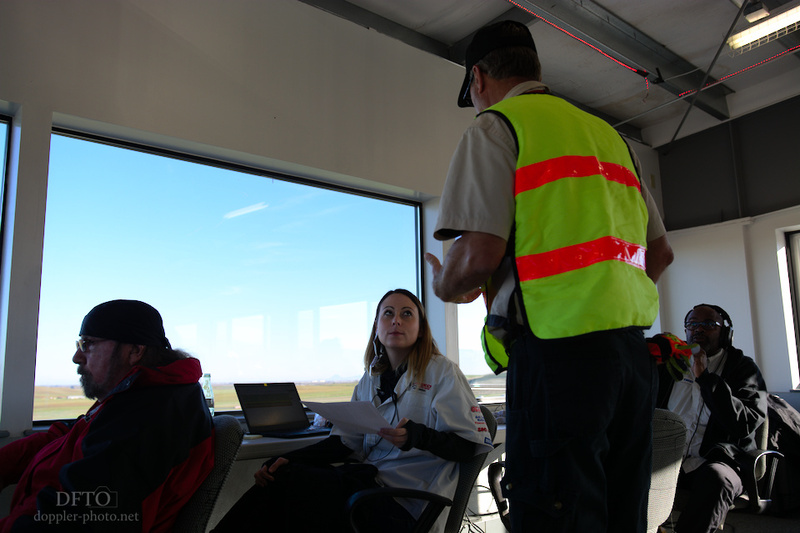 Jerry and two other officials (left) discussed the finer points of racing rules as the cars themselves circled the track at race pace. No incidents, clear track, green flag. 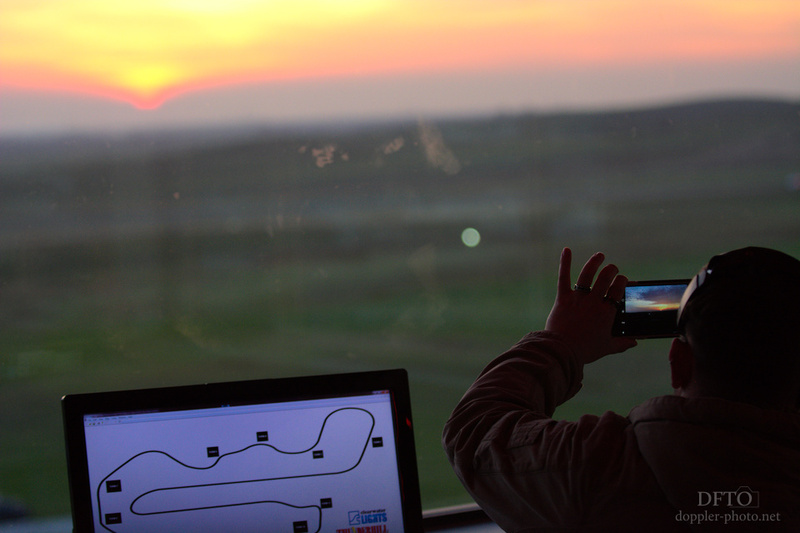 Some of the folks in the tower even took a moment to capture their front-row view of what was one of the more beautiful sunrises the race had seen in the last few years. As the end of the race approached, I reminisced on how different my own 2016 25-Hour experience had been compared to years past. After four years of a race that always felt more familiar, I managed to find a perspective that felt foreign; a perspective that showed how much I was missing all that time, even as I learned more and more and more. The unsettling feeling of witnessing the same familiar moment from somewhere completely new taught me that, yes, every time a wizened old face is replaced by a new one, the legacy of the race extends a little wider. But more importantly, sometimes that new visage is just the same old person with a new perspective. It taught me that the race persists not only by welcoming new people with open arms, by also by welcoming old-timers to jump into new and unfamiliar adventures. Sometimes, what brings people back isn't the hope that things might be a little different this year, but the challenge of trying to find new experiences in a place that feels familiar. And when it's all said and done, there's always time to see some race cars from up close.